The 2 Unit Ancient History Course in NSW has a core unit focused upon the archaeology and society of Pompeii and Herculaneum. The students are required to cover a number of topics including social classes and occupations and in an effort to encourage the students to take ownership of the topic I set up a ancient speed dating lesson for the class. The students had been looking forward to this lesson. How did it work? Each student was allowed to select a persona or role based upon a social class, occupation or actual individual that lived in Pompeii or Herculaneum. They researched the role and were required to be that person for the lesson. The desks and chairs were arranged like tables in a restaurant and the students sat down in pairs and they were given two to three minutes to chat to the person opposite. Not unlike speed dating I guess. Each student made inquiries of each other to discover more about the individual opposite. They took down notes and rated the person opposite based on their perception of how well they had mastered the role. I timed the pairings and the inner circle of students would move on to the next table and another round of meetings of minds would take place. The students were put on the spot and they had to present on a micro basis, one to one. The students were quite animated and taken in with the process. Upon conclusion they gave feedback regarding those classmates whom they felt had adopted their role quite well. The process was engaging, encouraged students to share and speak up with classmates that that may not normally engage with on a frequent basis. Some of the students adapted to their roles rather enthusiastically. It was good. It was different. It worked. 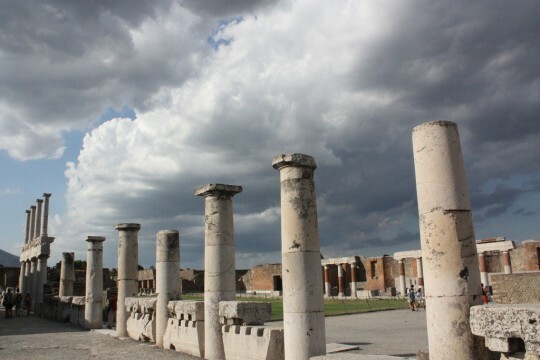 Photograph of Pompeii by Claron Niu (Shamefullyso). Creative Commons License.